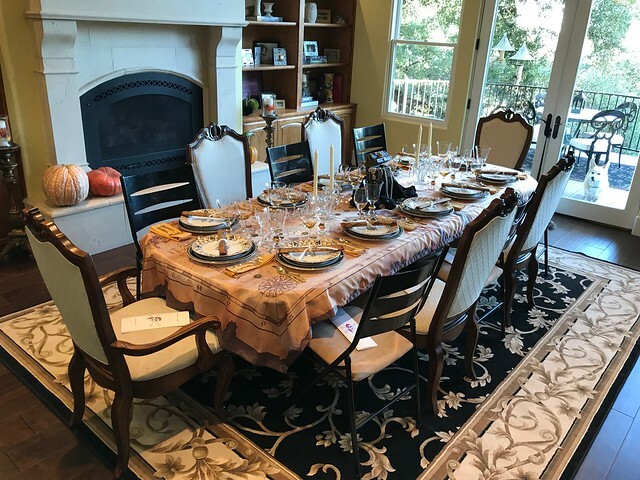 Sharon and I have made it a tradition to host a fall dinner party [2016, 2015, 2014, 2013, 2012, 2011, 2010, 2009, 2008, 2007, 2006, 2005, 2004, 2003]. This year, the group included the Gainsleys, Larkins, Renterias, Sanborns, Janie and Liz. 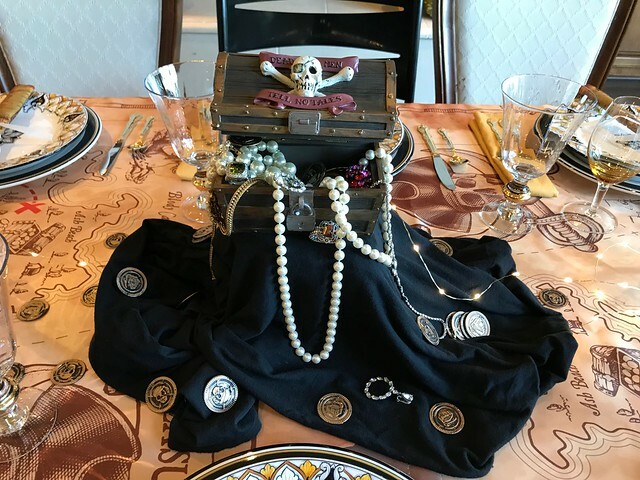 This year's theme was the Pirates of Carmichael. It revolved around Sharon and Janie's Caribbean Criuse. Everyone wore pirate costumes! Janie made a great before dinner rum drink. Sharon made a very nice dinner of ribs and chicken. Everyone seemed to really like the chicken and the sauce. The menu is here. After dinner, Tiber was barking on the deck. When I walked out to see what was going on, I realized that there was a large possum sitting the tree watching us! Although we didn't show any videos, it was a late night. Liz and the Sanborns rolled a little before 11 pm, but the Larkins, Gainsleys and Renterias stayed until after midnight. By the time, Tiber and I walked them to the front gate and toured the neighborhood, it was after 1 am before we were in bed. Sharon and Janie thought that the group was more subdued this year. I am not sure that I felt that way. We are all just getting older.